In today's world, many suffer from disorders of refraction (nearsightedness, farsightedness, astigmatism, nearsightedness, farsightedness or mixed), sootvetstvenno.u many questions arise: what to do - to treat or operate? In many cases, nearsightedness is hereditary (ie genetecheski zaprogammirovana). The essence of myopia is that the eyeball is used ? olshego size, respectively, the central parts of the retina distant from the point of intersection of the rays. To cure this condition is not possible, you can use the correcting means to improve vision (temporarily or permanently). You can use glasses or contact lenses - the most secure means of correction or make a correction of myopia, or laser surgery. Often the question arises: whether to perform surgery if no contraindications to it? Usually, the patient must be clear about how he needs surgery? If the nature of a long work at close range and the patient has myopia up to - 3.0 diopters, whether to perform surgery? Such myopia will allow him to lifelong work for a short distance without correction. If the patient is working, for example, a driver - truck driver, why not - would not operate? But we must bear in mind that after 40 years a person can not see well, and the same distance and near (because of the disruption of tissue elasticity of the lens), so in the postoperative period after reaching 40 years of above-zero korretsiya need to work at close range. As for the higher degrees of myopia, the patient should understand that such changes are accompanied refractive certain degenerative changes in the eyeball. 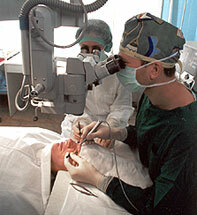 Refractive surgery (ie surgery to korretsii refractive change) does not relieve the patient from degenerative changes in the retina, but only saves the patient from glasses or contact linz.Dlya prevent retinal detachment is usually performed prophylactic laser coagulation of dystrophic lesions in the retina. It should also be borne in mind that refractive surgery carried out only stable in the presence of myopia (nearsightedness is not progressing to about 1.5 years) and after 18 years. The question of stabilization of myopia is also still open: myopia can be stable for 5 - 7 years, but due to stress, hormonal changes, etc., it can begin to progress as a result of the effect of the operation may be reduced. What type of refractive surgery to choose? There are different approaches and opportunities in a variety of vision correction centers. One of the earliest types of operations - radial keratotomy - the application of non-penetrative incisions in the cornea, resulting in the cornea, "flattened", changing its optical power, changing the course of the rays in the eye, in the end - is the point of intersection of rays on the retina. The effect of this operation up to - 6.0 diopters, the rehabilitation period - about 2 nedel.Dlya high degrees of myopia korretsii more appropriate to use the excimer - laser technique allows korretsii.Eta otkorregirovat myopia up to 10.0 - 12.0 dioptriy.V case of higher degrees of myopia (more than - 15.0 diopters), it is advisable to make transparent lens removal and implantation of an intraocular lens corresponding diopter powers. There are also methods of correcting myopia lens implanted inside the eye without removing their own hrustalika.Effekt such an operation is 6.0 - 7.0 diptry. Advantage - the reversibility of the changes, ie if necessary, or changes in vision may remove the intraocular lens. With respect to security operations, patients should be psychologically prepared for the fact that no transaction is absolutely secure. For example, if keratotomy weakens the strength of the cornea, in the case of excimer laser correction may experience changes in corneal transparency, which in turn leads to a decrease in severity as zreniya.Vstrechayutsya and infectious complications. It should be remembered, and that a small percentage of myopia may be partly to "return" (ie, the regression effect). This may be due either to the characteristics of healing, or a moment progessirovaniya blizorkuosti. In order to avoid complications is necessary to conduct a thorough preoperative examination. Refractive surgery does not show people with diabetes, connective tissue diseases, hormonal disorders, pregnant zhenschinam.Suschestvuyut contraindications, and by Authority of: inflammatory diseases of the cornea, glaucoma, cataracts, dry eye syndrome, detachment of the retina (the operated previously), etc. Therefore, only a doctor after a thorough examination can determine the feasibility of the operation, type of intervention and possible post-operative effect.